Libyan human rights activist Salwa Bugaighis was shot dead by unidentified assailants in her home in Benghazi. According to media reports, the prominent lawyer was shot several times by men wearing military uniforms. The rights activist was rushed to the hospital, but died shortly afterwards. Her husband who was also in their home at the time the incident happened, has been reported missing. Ms. Bugaighis played an active part in the 2011 Libyan revolution that ousted the regime of Muammar Gaddafi. The lawyer was a former member of the National Transitional Council. The group is the main rebellion’s political wing. Prior to her death, she participated in Libya’s general election. She published photos of herself at a polling station on her Facebook page. Benghazi has become a hub for jihadists and the place for a series of deadly attacks and assassinations. The Libyan military, police and judges are targeted for assasinations and harrassment. 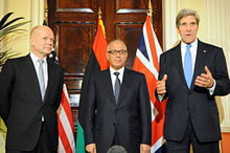 Libyan Prime Minister Ali Zeidan with U.S. Secretary of State John Kerry and British Foreign Secretary William Hague, November 2013. In her statement, U.S. Permanent Representative to the United Nations Samantha Power said the United States condemns in the strongest possible terms the brutal assassination of human rights activist Salwa Bugaighis. Ms. Power expressed her admiration of Ms. Bugaighis’ courage and leadership in Libya’s democratic transition. Ms. Power said Bugaighis’ abiliity to advocate with political insight and deep, selfless conviction won her the respect of Libyans from all walks of life. Libya has been engulfed in fighting since a pro-democracy movement opposed to the regime of Muammar al-Qadhafi emerged in February 2011 following similar protests in Tunisia, Egypt and other countries across North Africa and the Middle East. Hundreds of people have been killed in the fighting and hundreds of thousands of others have been internally displaced or forced to flee to neighbouring countries. The United States has played a central role in marshalling the international response to the crisis in Libya. Together with its partners, they saved thousands of lives and helped confront a ruthless, erratic dictator who was poised to slaughter his own people in order to hold on to power. Gaddafi’s demise marked the end of a 42 year rule of a dysfunctional brutal regime that was ruled by fear, torture and executions. Its mismanagement of the economy brought ruin to Libya and impoverished the Libyan people despite the huge oil and gas wealth. Unfortunately, Libya is a long way from being considered stable. Just last year, on the anniversary of 9/11, Christopher Stevens, The U.S. Ambassador and three other Americans were killed in Benghazi, in an organized attack on a poorly protected safe house acting as a consulate. Many questions remain, including why the consulate was so poorly protected, why the security contingent had recently been withdrawn by the Administration, and why, when the Administration saw the attack, and the Ambassador was still alive, assistance was withheld.